Military analysts at IHS Jane’s say the Takfiri ISIS terrorist group has lost control of 22 percent of territory it held in Iraq and Syria since the beginning of 2015. 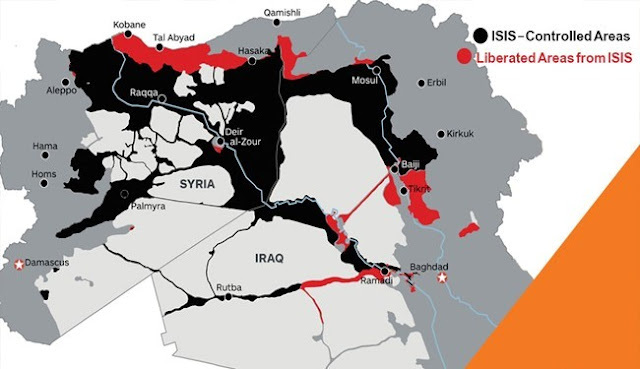 The IHS Conflict Monitor said in a report released on Wednesday that the ISIS terrorists lost 14 percent of swathes of territory they held in 2015 and a further eight percent this year. The report stated that the US and Russian air raids have contributed to the advance of forces fighting ISIS. Columb Strack, senior analyst at IHS, said the Syrian government has made gains in western Syria and is now five kilometers outside the ancient city of Palmyra, which was captured by ISIS in mid-2015. IHS Jane's said the terrorists controlled 73,440 square kilometers (28,360 square miles) of ground as of Monday. ISIS is “increasingly isolated, and being perceived as in decline," said Strack, who added that "isolation and further military defeats" will make it harder for ISIS "to attract new recruits to Syria from the pool of foreign jihadists." IHS further noted that ISIS has begun to suffer financial difficulties since it lost the strategically important town of Tal Abyad on Syria's border with Turkey last year. Strack said the US and Russian air attacks have exacerbated the group's financial difficulties as the warplanes hit the terrorists’ sources of oil revenue. Russia launched its air campaign against the Takfiri ISIS terrorists and other militant groups in Syria on September 30 upon a request from the Damascus government, but the country announced pulling out its military equipment from Syria on Monday, saying its campaign had contributed to "radically change the situation in the fight against terrorism." The US, along with some of its allies, has also been conducting air raids against purported ISIS positions inside Syria without an authorization from Damascus or a UN mandate since September 2014. The air assaults are an extension of the US-led aerial campaign in neighboring Iraq, which started in August that year. Many parties to the coalition are widely accused of having contributed to the rise of terror groups in Syria over the past few years, Press TV reported.